One of the best things to do in Koh Phi Phi is to hike to the viewpoints. The viewpoint hikes are the only way to get the famous photos of Koh Phi Phi. The island is made up of two large rock formations connected by a large strip of sand. Most visitors to Koh Phi Phi stay in the town which sits on the connecting strip of sand, but make sure to plan part of a day to hike Koh Phi Phi Viewpoints while on the island, you won’t be disappointed. The best views of the island come with a little work. A steep hike is the only way to reach the highest point on the island. There are also dirt bike taxis that will take you up and down the steep hills most of the way for a fee. Once up there three viewpoints await you, each providing a great photo-op. You just need to know where you are going. The most common way to reach the viewpoints is via the traditional trail which begins with a few sets of concrete stairs. From the Tonsai Village head west toward the edge of the village. From here you should start to see signs for both “Viewpoint 1” and “Tsunami Evacuation Route”. The trail starts with a very steep set of stairs and usually there is a hand-painted wooden sign. If you are not starting your hike with a steep set stairs you are not in the right spot. Another way to reach the viewpoints is by the road. This route is longer but has fewer steps and you ascend more gradually. However, there is much less signage on this route. If you are looking for an adventure you will pass through a more local side of the island. For those that want to skip the hike and just get to the viewpoint, you can arrange with a motorbike taxi to bring you to the top. Most will wait and charge you a round trip price. On average the cost of this trip should be around 500 baht to 1000 baht depending on your negotiating skills. In recent years there is now an entrance fee charged to visit the viewpoints of 30 baht. Hopefully, the fee will help maintain the trails and signage which was lacking in years past. The fee seems to change frequently and sometimes comes with a bottle of water. Reports from this year 2018 are that the fee is 20 baht, but don’t be surprised if it is higher or lower. Do Not attempt the hike without bringing some cash for the fee or you will not be allowed to enter. Sunrise is a great time to visit since it will be cooler, fewer people, and great photo opportunities. However early in the morning or the late afternoon, you will not get the beautiful color in the water. The best time to see the bright blue and turquoise water colors in both bays is around mid-day from about 10 am – 2 pm. The afternoon will be the hottest times, but the hike isn’t too long. Sunset can also be a great time to visit the Koh Phi Phi Viewpoint. There are two small stores on top of the hill selling drinks, but you will be happy you have the water for your climb. Late March was the time of year we made our trek, and the temperature was over 100 F.
The hardest part of the hike is behind you at this point. Here you’ll have to pay your entrance fee. The first viewpoint on your hike will have some impressive views, but the best is yet to come. The higher you trek the better the views of the water and island will be. Here you’ll get views in line with the isthmus (Phi Phi’s thin strip of land), some of which is blocked by a hill with a few resorts on it. Another stunning view of the isthmus of Koh Phi Phi. Higher and fuller view of the island can be had from Viewpoint 2. From this point, most of the island can be seen, but not all. Great views and much less crowded than the final and best view at Viewpoint 3. Here you’ll find the best view in Koh Phi Phi. Large stones make up the viewing platform which depending on the season and time of day can become crowded. At Viewpoint 3 you will also find a small store selling drinks and snacks. Once you have snapped your photos this viewpoint is a nice place to hang out and take in the views. If you can time your trip up an hour or half an hour before sunset, this is one of the best times of the day. The Koh Phi Phi Viewpoints face west looking toward the island making sunset one of the best times to visit. Sunrise can also be nice but the sun will not be behind the rest of Koh Phi Phi you are looking down on. The benefits of hiking at sunrise are that the temperatures will be much cooler and you should have the viewpoints almost all to yourself. Since Koh Phi Phi is kind of a party island most people are just going to bed rather than waking up for sunrise. If you decide to attempt the hike for sunrise or sunset make sure to bring a flashlight or head torch because one way of your trip will be in the dark. If you are looking for even more hiking in Koh Phi Phi after visiting the viewpoints continue on to Rantee Beach on the other side of the hill. In addition to Rantee Beach, you can also hike to several other smaller beaches including Ao Tohko, Paknam (Relax Beach), Rantee and Lo Bakao. The beaches will add an additional 30 minutes to an hour of hiking past the viewpoint hike. Lo Bakao is the furthest away and will take around an hour of hiking past the viewpoint platforms, the rest of the beaches will be around 30 minutes. View Rantee Beach on the map. However, it does not have the trail marked so distances are not accurate. Q: How high is the highest point on Koh Phi Phi? Q: Is it safe to hike to Koh Phi Phi Viewpoints? Q: Is alcohol Allowed on the viewpoints? A: No, currently no alcohol is allowed on the viewpoints for safety reasons. The Koh Phi Phi viewpoints are a must if you find yourself on this beautiful island! 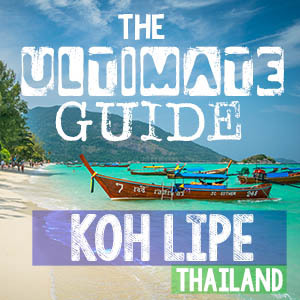 For more information on Thailand Islands check out our Island Hopping Guide! The fee for viewpoint 1 & 2 is still 30 baht but viewpoint 3 now requires you to at least but a water for 20 baht. They also have noodles, smoothies, and chips.